Provides a user interface for paging through a collection of data. The DataPager type exposes the following members. DataPager Initializes a new instance of the DataPager class. AutoEllipsis Gets or sets a value that indicates whether to use an ellipsis as the last numeric button. CanChangePage Gets a value that indicates whether the user can move to another page. CanMoveToFirstPage Gets a value that indicates whether the user can move to the first page. CanMoveToLastPage Gets a value that indicates whether the user can move to the last page. CanMoveToNextPage Gets a value that indicates whether the user can move to the next page. CanMoveToPreviousPage Gets a value that indicates whether the user can move to the previous page. DisplayMode Gets or sets a value that indicates how the DataPager user interface is displayed. IsTotalItemCountFixed Gets or sets a value that indicates whether the total number of items in the collection is fixed. ItemCount Gets the current number of known items in the source data collection. NumericButtonCount Gets or sets a value that indicates the number of page buttons shown on the DataPager user interface. 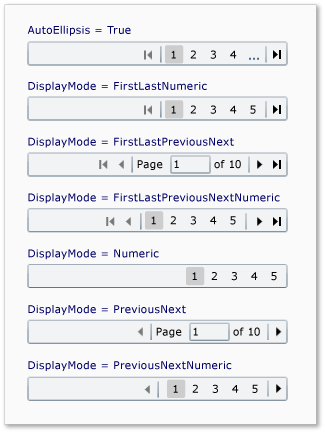 NumericButtonStyle Gets or sets the style that will be used for the numeric buttons. PageCount Gets the current number of known pages if the source is an IPagedCollectionView. PageIndex Gets or sets the index of the current page. Source Gets or sets the data collection that the DataPager controls paging for. PageIndexChanged Occurs when the PageIndex has changed. PageIndexChanging Occurs when the PageIndex is changing. AutoEllipsisProperty Identifies the AutoEllipsis dependency property. CanChangePageProperty Identifies the CanChangePage dependency property. CanMoveToFirstPageProperty Identifies the CanMoveToFirstPage dependency property. CanMoveToLastPageProperty Identifies the CanMoveToLastPage dependency property. CanMoveToNextPageProperty Identifies the CanMoveToNextPage dependency property. CanMoveToPreviousPageProperty Identifies the CanMoveToPreviousPage dependency property. DisplayModeProperty Identifies the DisplayMode dependency property. IsTotalItemCountFixedProperty Identifies the IsTotalItemCountFixed dependency property. ItemCountProperty Identifies the ItemCount dependency property. NumericButtonCountProperty Identifies the NumericButtonCount dependency property. NumericButtonStyleProperty Identifies the NumericButtonStyle dependency property. PageCountProperty Identifies the PageCount dependency property. PageIndexProperty Identifies the PageIndex dependency property. SourceProperty Identifies the Source dependency property. The DataPager control provides a configurable user interface for paging through a data collection. You typically use a collection that implements IPagedCollectionView as the data source and the IPagedCollectionView provides the paging functionality. You can bind the DataPager to any IEnumerable collection; however, the DataPager will behave as if the data is all on a single page. To provide paging functionality for an IEnumerable collection, you can wrap it in the PagedCollectionView class. If you use the DataPager in an application with an Entity Framework data store, you must order the data returned by your queries for the DataPager to work correctly. The Entity Framework does not support paging of data without an OrderBy clause. The paged data is typically displayed in a control that represents a collection, such as a DataGrid or ListBox. To use a DataPager to page through data in another control, you assign the control's ItemsSource property and the DataPager.Source property to the same data collection. You can modify the appearance of the DataPager by setting the DisplayMode property. If you use a DisplayMode that displays numeric buttons, you can change the number of buttons displayed by setting the NumericButtonCount property. You can set the AutoEllipsis property to true to have the DataPager display an ellipsis in place of the last numeric button, unless the ellipsis would be the last page. You can also modify the appearance of the numeric buttons by setting a custom NumericButtonStyle. The following illustration shows the DataPager configured to use different display modes. The DataPager control is available as part of the libraries in the Silverlight Software Development Kit (SDK). For more information, see the Silverlight Tools. To apply the same property settings to multiple DataPager controls, use the Style property. To change the visual structure and visual behavior of a DataPager, copy and modify its default style and template. For more information, see Control Customization. Dependency properties for this control might be set by the default style of the control. If a dependency property for a DataPager is set by its default style, the property might change from its default value when the DataPager appears in the application. For more information, see Dependency Property Value Precedence. You can get the default style and template for DataPager from DataPager Styles and Templates. Setting a visual property will only have an effect if that property is both present in DataPager control's default template and is set by using a TemplateBinding. You can find a list of visual properties in the "Changing the Visual Structure of a Control" section of Customizing the Appearance of an Existing Control by Using a ControlTemplate. The following code example demonstrates how to use a DataPager to page through data displayed in a ListBox. The List<T> that stores the data is wrapped in a PagedCollectionView, which provides paging functionality. Both the DataPager and the ListBox use the PagedCollectionView as their data source.
' Generate some items to add to the list.
' Set the DataPager and ListBox to the same data source. // Generate some items to add to the list. // Set the DataPager and ListBox to the same data source.